Julie sat behind the counter off to the side of the studio, absently watching her grandmother teach an adult ballroom class. Her mind wasn't all there though, since she was thinking of Dylan and the kiss he'd surprised her with. It had been several days, yet every time she closed her eyes it felt like he was kissing her right then. Her lips tingled at the thought. Her grandmother's words brought Julie back to the present. "Now, normally I have my granddaughter, Julia, present how the waltz should look. Unfortunately, my male student teacher Emilio is out sick today so I guess..."
Dottie's voice trailed off and her face broke into a smile. Julie looked out the storefront window to see who her grandmother was smiling at and beckoning into the studio and nearly gasped when Dylan walked in. Dottie told the class she would be right back and made her way over to Dylan, who was making his way over to Julie. "Dylan! You walked by just in time, querido!" "What can I do for you Miss Dottie?" Dylan said, grinning at both women. Dottie took one of Dylan's hands and one of Julie's and pulled them toward the students. "Julie needs a partner to show the class how to waltz." Both Julie and Dylan stopped in their tracks. "Miss Dottie," Dylan started, "You know I'd do anything for you but–"
"He can't dance, 'Lita," Julie said, cutting off whatever Dylan was going to say. Dottie looked from Julie to Dylan, then waved her hand. "Nonsense! He's a natural." Without giving them a chance to argue, Dottie turned and made her way to the stereo. Julie turned to Dylan with an apologetic look on her face as the music started. "I'm so sorry that she's putting you on the spot like this...I–"
Her words were lost as Dylan took her hand, spun her to him and then placed one hand on the small of her back, while holding the other hand with his in the perfect stance to begin a waltz. Julie looked up at him with a shocked look on his face. There was no way he just knew how to do that. His frame was too correct. "I knew you could dance," she said. 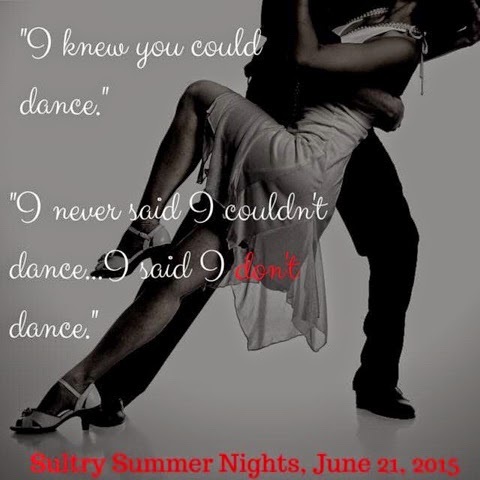 He pulled her a little closer to his body before he pressed his mouth to her ear and said in a whisper, "I never said I couldn't dance...I said I don't dance." And then he was leading her around the dance studio, waltzing with her. She looked up at him and he gave her a small grin. "I'm glad I haven't stepped on your toes," he teased. "I'm pretty rusty at this form of dancing." But she never would have known. They were so in sync as they moved, she felt as though they were gliding. The music ended and she eased to a halt. They stood there, with Julie still in Dylan's arms, just gazing at each other. The loud applause snapped Julie out of whatever trance she'd been in and she looked around. An odd feeling began to wash over Julie and she backed out of Dylan's hold. "Oh that was beautiful, you two!" Dottie said, hurrying over to them. Julie took a step back suddenly feeling overwhelmed. "Are you all right?" Dylan asked a look of concern clouding his face. "I...excuse me," she whispered before turning and running toward the back.